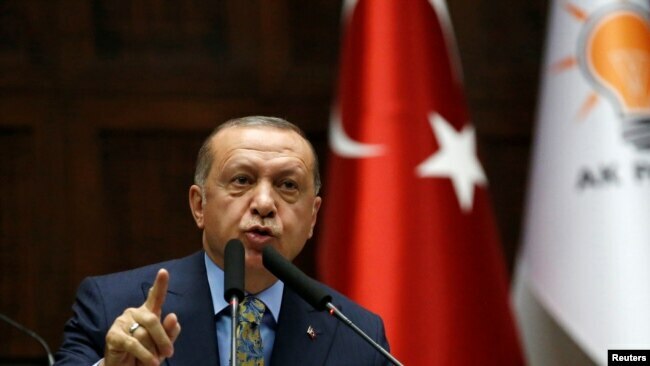 Turkish president Recep Tayyip Erdogan continues to ratchet up pressure on Riyadh over last month’s killing of Saudi journalist Jamal Khashoggi at the Saudi consulate in Istanbul. Tuesday saw the front page of the Turkish pro-government Sabah newspaper carry pictures of x-ray images of the alleged Saudi hit team suitcase purportedly showing tools to murder Khashoggi. The newspaper story is the latest development in what analysts see as a carefully calibrated campaign by Ankara against Riyadh. Turkish President Tayyip Erdogan addresses members of parliament from his ruling AK Party (AKP) during a meeting at the Turkish parliament in Ankara, Turkey, Oct. 23, 2018. Erdogan announced last week an audio recording of the last minutes of the Saudi writer’s life had been shared with the U.S., Saudi Arabia, and key European powers. Ever since the killing of Khashoggi on October 2, Ankara, through the careful release of information to the media, has dashed any hopes by Riyadh that the controversy would peter out. In the first weeks after Khashoggi’s murder, speculation was rife Ankara was looking for substantial concessions from Riyadh, including financial and economic support for Turkey’s crisis-ridden economy. Days after the Khashoggi death a key aide to Saudi King Salman flew to Istanbul to meet with senior Turkish officials. King Salman, in a rare move, stepped out of semi-retirement to speak by telephone with Erdogan. Despite such intervention Erdogan dismissed as “bribery” any talk of financial concessions from Riyadh, saying he was committed to finding and holding to account Khashoggi’s killer. However, the Turkish president is careful not to accuse King Salman of any involvement. Instead, Erdogan’s rhetoric increasingly appears to be focusing on Saudi Crown Prince Mohamed bin Salman. “ As I have already said, apart from the perpetrators, the one who gave them the order should also be found,” Erdogan said, a reference widely interpreted to be mean the crown prince. Riyadh has repeatedly denied the crown prince had any involvement in the murder, a claim many analysts suggest is difficult to believe, given the power Salman wields in the Kingdom. Khashoggi’s death is seen as giving Erdogan a possible once-in-a-lifetime opportunity. “Mohammed bin Salman is a key rival to Erdogan in the battle for hegemony across the Sunni Middle East,” said international relations professor Huseyin Bagci of Ankara’s Middle East Technical University. A senior western diplomat, speaking anonymously, concurred, pointing out there is little international support for any unseating of the crown prince given the risk of regional instability. If Erdogan is targeting the Saudi crown prince, such a move could threaten to reopen tensions with Washington, analyst Yesilada suggests, as it “would severely complicate the American effort to push back Iran.” The crisis over Khashoggi’s killing has so far been the basis for an improvement in U.S. Turkish ties, with observers saying Washington and in particular U.S. President Donald Trump see Erdogan as key to giving Riyadh a way out of the predicament. However, Erdogan’s tough stance against Riyadh has resulted in the Turkish president enjoying rare international plaudits. Before the Saudi’s killing, Erdogan was regularly maligned for holding the record, according to rights groups, as being the world’s worst jailer of journalists, a charge Ankara denies. The Khashoggi crisis has underlined that Turkey and Erdogan remain key international players. However, is that enough for the Turkish president or does he believe he has a rare, if not unique, opportunity to bring down a critical regional rival or at least severely weaken him? That is a question analysts say regional and international powers will likely be asking. Observers point out the Turkish president has a proven record as a risk taker and playing for high stakes. For now, Erdogan appears content to keep everyone guessing as well as wondering what other evidence Turkish investigators have in connection with Khashoggi’s death.